Construction of the Metro Tunnel Project will see temporary but extended road and lane closures to travel routes into and around the city. People may need to consider changes to their routes to avoid and minimise delays. We thank cyclists for their patience and understanding in relation to these unavoidable disruptions as we deliver this transformational public transport project for Melbourne and Victoria. To enable the construction of the new underground Parkville Station, Grattan Street (between Royal Parade and Leicester Street) closed to traffic in February 2018 for up to five years. There is no on-road bicycle access. Pedestrian access has been maintained along Grattan Street with some diversions in place for cyclists. Franklin Street, between Victoria Street and Swanston Street, and A’Beckett Street, between Swanston Street and Stewart Street, were closed to traffic and cyclists in January 2017 for the start of works on the new underground State Library Station. To enable the construction of Anzac Station, Domain Road has closed between St Kilda Road and the western edge of Edmund Herring Oval for approximately five years from mid-2017. Vehicles and cyclists are not able to access this section of Domain Road. In February 2018, St Kilda Road was temporarily reconfigured to one traffic lane in each direction between Dorcas Street and Toorak Road West for up to four years. Tram, pedestrian and bicycle access will be maintained as the new Anzac Station is built under the roadway. There will be other temporary changes to local cycling routes along the Metro Tunnel alignment during construction, including in Kensington, North Melbourne, Parkville, the CBD, Domain and South Yarra to help facilitate construction. These changes will be communicated to cyclists well in advance of works starting. A number of initiatives are being delivered across the bicycle network to help keep cyclists moving, including redesigning some intersections and road layouts. These changes are underway at a number of locations. Works have been completed on Queensberry Street, between Elizabeth Street and Rathdowne Street, to allow traffic to flow more efficiently through the north of the city. The bicycle lanes on both sides of Queensberry Street have been improved, providing a dedicated route for cyclists. Green coloured road markings have been applied between intersections to increase the visibility and awareness of the bicycle lane to drivers and cyclists. 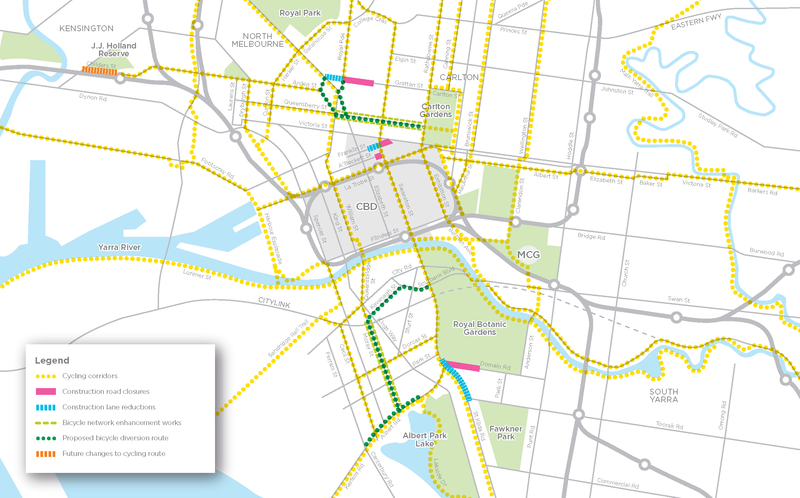 Upgrading the Moray Street bike path provides cyclists with a convenient alternative route to St Kilda Road. The existing Moray Street bicycle lane is being improved between Albert Road and Queensbridge Street and includes safer connections to the Kavanagh Street and Queensbridge Street bike paths. Intersections are being made safer using extended kerbs and raised zebra pedestrian crossings, and the changes involve a reduction in speed limit to 40km/h. The intersections at these locations are being upgraded to improve safety and connectivity for cyclists to the upgraded Moray Street bike lanes. VicRoads, City of Melbourne, City of Port Phillip and City of Stonnington will continue to deliver cycling infrastructure projects during construction of the Metro Tunnel Project. Rail Projects Victoria (RPV) is working closely with local councils and other government agencies to manage construction impacts on cyclists. Whether you are cycling on the road, using a bicycle lane or path, riding as part of a group or cycling at night, you should ride responsibly and safely. As a cyclist, you are required to obey the same road rules as motorists. Melbourne Bike Share is a public bike sharing scheme that operates in the City of Melbourne, the City of Yarra and the City of Port Phillip. It is a sustainable, healthy and community-based bike sharing scheme. To view a map of the current bike share locations, visit their website. For advice on how to get started with cycling, riding in traffic, tips for riding in wet weather and much more, vistit the Bicycle Network Victoria website. Download the information on this page as brochure.